Blake Christina Lively is an American actress and model who stars as Serena van der Woodsen in the television teen drama series, Gossip Girl. She has also starred in movies, including Accepted, The Sisterhood of the Traveling Pants, The Private Lives of Pippa Lee, The Town and Green Lantern. As with all starlets in this day and age Blake Lively opted for a new nose early on in her career. The Gossip Girl star has been linked to all sorts of Hollywood Hotties, even busting up a few relationships reportedly, but it’s her new nose that’s got us talking! Upon comparison of these before and after photos of Blake we can assuredly say she visited the plastic surgeons office for a rhinoplasty procedure. 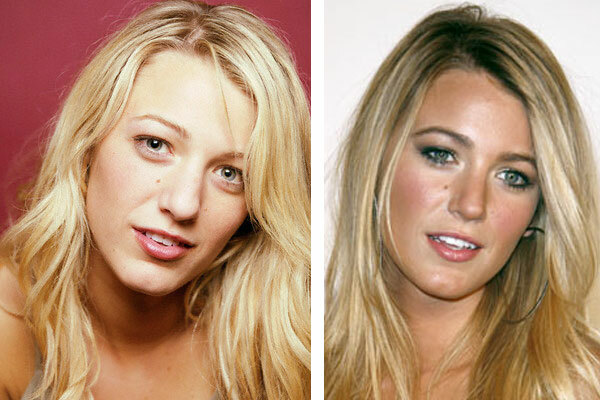 Blake Lively’s nose in the first picture is more bulbous and round at the tip, in the after photo it is still the same shape but with a more refined tip. This is a great example of how a small procedure like a nose job can change the whole look of your face.